Over exposed to high growth tech stocks such as Facebook? Give this top investing strategy a try. The solution to over-exposure in tech. A while ago, I was attending the investment committee of a major university when one of my colleagues, Dan Paduano of Neuberger & Berman, made an interesting suggestion. It was such a clever and should-be-obvious idea, that I decided to do some research. Bottom line: if you own a S&P index fund you really must consider this strategy. First some background. Most S&P 500 index funds are capitalization weighted. That means that the larger the company, the more weight it has in the index. Lesser known are the equal-weighted S&P 500 index funds, where every stock has equal weight, no matter the company's size. This is important in our investment world today for several reasons. One is that the stock market has been on a tear for many years and investors are understandably worried about a correction, or worse. Another factor is that the tech stocks have led the stock market sprint to all-time highs. Because the index is cap weighted, the impact of the tech stocks on the S&P 500 is massive and has been growing for the past few years. You've likely heard of the tech leaders referred to as the FANG stocks, which include Facebook (FB , Amazon (AMZN , Netflix (NFLX , Alphabet (GOOGL , to which we add Apple (AAPL and Nvidia (NVDA , which are undeniably part of this tech group. Now, look at the impact these six names have had recently on the S&P 500 index. Learn why Apple and other big cap tech stocks are still solid investments. 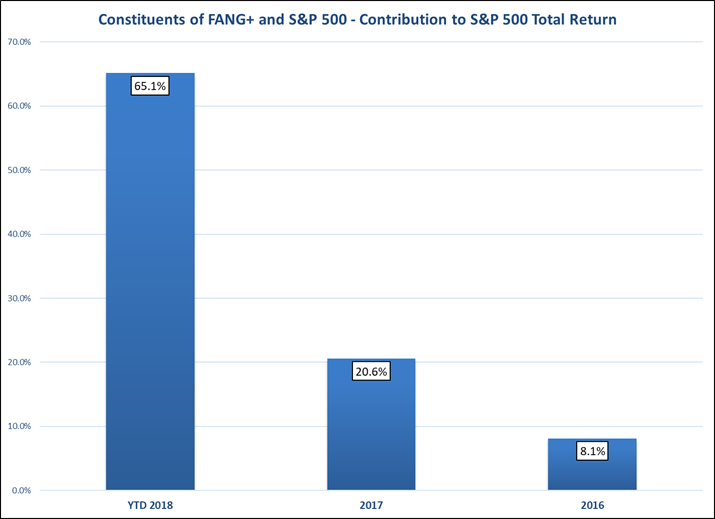 This chart tells us that in 2018, through mid-May, the FANG + two stocks have accounted for a remarkable 65% of the gain of the index. Put another way, just six among 500 stocks have accounted for two-thirds of the gains in the index. Imagine that. Given that these stocks tend to rise and fall in sync, you should be asking: what happens if the tech stocks fall out of favor? Glancing once again at the chart, I'd rather not think about it. One solution is to just get out of stocks, or at least the index fund. But do we really want to do that? Long ago, I interviewed the legendary Peter Lynch for my book, Investment Gurus. Peter doesn't believe in market timing. He can back it up with a performance record at the Magellan Fund that I am confident will never, ever, be equaled. Peter is also fond of saying that there are no market timers in the Forbes 400. Investors should stay invested and mitigate the stock market risk however they can. Here's a clever solution to the dilemma though. Switch your S&P 500 index fund from cap-weighted to equal-weighted. Remember, the equal-weighted fund weighs all the 500 stocks equally. So, if the FANG stocks crash, it will have minimal effect on the equal-weighted index. After all, this is just 6 out of 500 equal-weighted stocks. If you've held your index fund in a retirement account, there will be no tax effect from the switch. If your account is taxable, the switch still might be worthwhile. Check with your tax advisor. How to Play Today's Risky Markets. Visit here and register for free to watch what top experts from Bank of America, Fisher Investments, Invesco and Wells Fargo say smart investors should do now. Your next question should be: what am I giving up in performance to hold the equal-weighted versus the cap-weighted? Surprise! 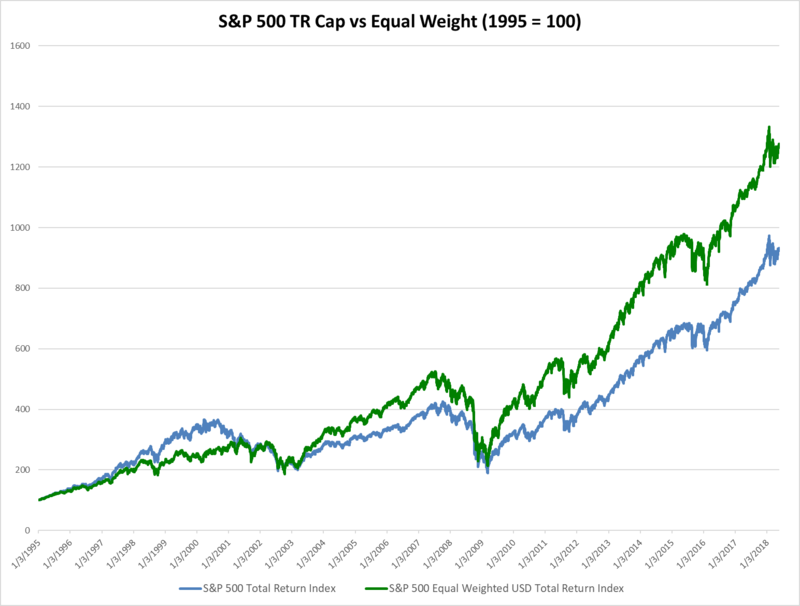 The equal-weighted has outperformed the cap-weighted going back to 1995. The chart below shows the performance of both, and the results speak for themselves. Note that during the dot.com bubble the cap-weighted index outperformed. When the bubble burst, it was no surprise that the equal weighted handily outperformed. Over this long period of nearly 23 years, the annualized rate of return for the cap-weighted S&P 500 index was 10%. The equal-weighted return for the same period was 11.49%. Point made? It isn't as easy to find the equal-weighted index funds as it is to buy the more common cap-weighted. One option to consider for performance and low fees is the PowerShares S&P 500 Equal Weight Portfolio ETF (RSP . Give the strategy some thought. You might be happy you did. Tanous is chairman of Lynx Investment Advisory in Washington, DC. He is the author of many books on the stock market and the economy, starting with Investment Gurus, published in 1998, an international best-seller. His more recent books include The End of Prosperity, co-authored with Dr. Arthur Laffer and Stephen Moore, and The 30-Minute Millionaire, written with Jeff Cox of CNBC.